Different methods have been used by body builders to train for a thick chest and massive biceps. But very few can match the results produced by this one-day split training program. Here is an easy-to-follow program that will enable you to train for a massive chest in the morning and skin-stretching biceps in the evening. Doing three sets of ten reps of each of these workouts will activate muscle fibres that will give produce desired chest and biceps in a very short time. This workout focuses primarily on the upper region of the chest. 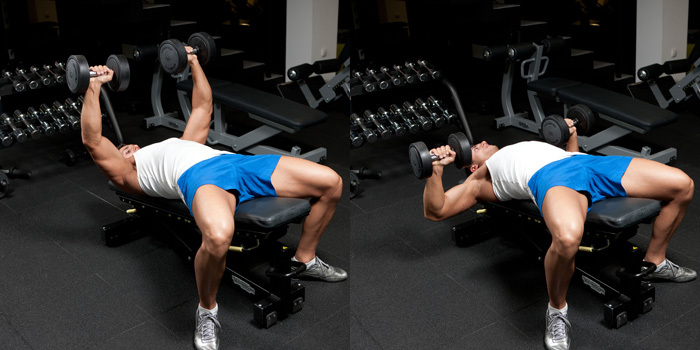 With dumbbells in your two hands, and your palms facing forward, lie down on an inclined bench. Raise your arms above your head and lock them. Then start lowering your dumbbells in between the upper and central section of your chest. Manage the weight carefully and control it as you bring it down. Ideally, you should take about two to three seconds to reach the base of the movement. Then you can move back up rapidly. This will quickly exhaust your muscles and cause new ones to grow. Flat bench press movements will produce thick muscle mass in your upper body. With your two feet resting firmly on the ground, lie down comfortably. Take dumbbells in each hand and let your palms face forward. 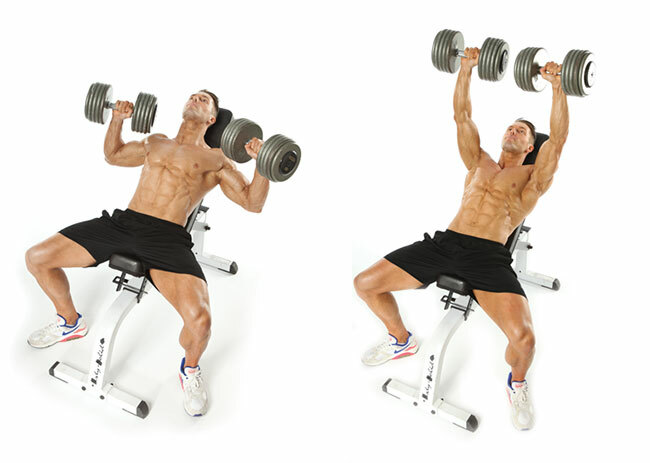 As you did in the inclined dumbbell press, raise your arms out and lock them out overhead. Then start moving the dumbbells between the upper and central portion of your chest. In similar fashion, maintain control over the weight and bring it down, over two to three seconds, then move up quickly again. This workout will give your chest a sharp look and round it out at its base. With your bench set at 30 degrees, begin with the dumbbells positioned outside the upper chest and then press them upward to the midline till they nearly touch the centre. Lower your dumbbells down in a slow and steady manner. To experience an explosive growth in biceps you should combine picking the best pre-workout supplement with doing a few of these high intensity sets since bicep muscles wear out quite fast. Proceed by grabbing a barbell using an underhand grip. Stand up straight, square up your shoulders, and let your hands and feet be shoulder-width apart. Curl the barbell up to your chest taking the course of an arc, without swinging the bar. Keeping your elbows in the same position, close to your side, raise the bars up as high as possible and squeeze your biceps at the top to pull in as much blood as you can into the area. Lower the bars gradually, providing resistance all the way till your arms are almost straight. Dumbbell curls will allow you to get a full range of motion and achieve a total stretch and the end of the movement. 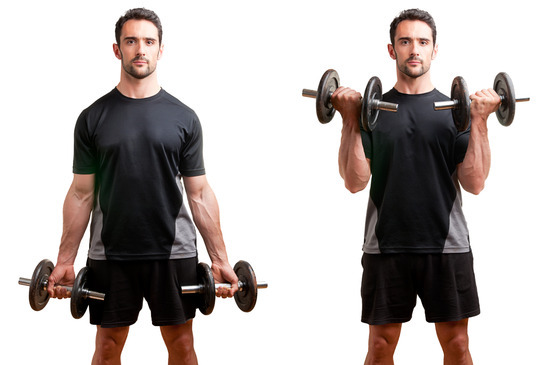 With your arms extended down, hold two dumbbells. 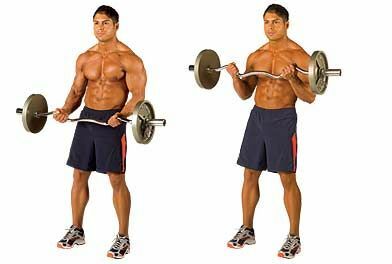 Curl your dumbbells up and out with your two hands and turn each wrist as you raise the weights. Thus, you will squeeze the biceps to greater contraction and force them to expand. Then gradually, return the weights to their starting position with adequate control and resistance. It takes hard work and consistent effort to build up your chest and biceps like a professional body builder. However, if you follow the instructions provided here, you will be on your way to developing a thick chest and sleeve ripping biceps in a short time.